Häfele’s partnership with movement specialists Grass has always been a compelling one with both businesses working in allegiance to provide stand out solutions for the furniture fittings and architectural hardware market. We are pleased to announce our latest offering, the brand-new Grass Dynapro Undermount Runner System. 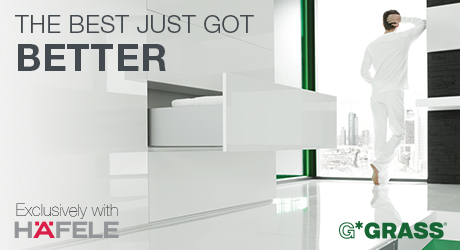 The latest version of Grass’ market leading slide system is now available exclusively from Häfele, and takes what is already regarded as the best under mount drawer slide in the market, and makes it even better. Dynapro already offers unparalleled quality and performance, boasting excellent operating comfort, precision, stability and exceptional running performance. Not content with this, Grass’ vision and continuous drive for innovation has produced a superior offering from the Dynapro Slide System. It is this vision and continuous drive for exceptional products across its entire spectrum of ranges that aligns so closely with Häfele’s fundamental values. Having the freedom and creativity to produce truly unique furniture lies at the core of the latest iteration. The new Dynapro Undermount Runner System includes 4D adjustment as standard, providing sideways, back/forth, tilt and up/down movement. Ideal for bespoke drawer boxes and applications where the drawer slider needs to be concealed in-situ, this feature ensures the ultimate fit and effortless movement regardless of cabinet design. In line with the focus to create ingenious storage for just about every space conceivable, the latest version delivers features that create a completely handle-free door that encompasses elegance and convenience. The soft close mechanism has been improved with the addition of an integrated liquid damper to ensure a continuous soft close motion that is even smoother and quieter than its predecessor. This is enhanced further with the Touch to open functionality that can be added to the soft close mechanism, resulting in delicate movements for the ultimate easy opening experience. The new Grass Dynapro, with 4D adjustment as standard is available exclusively from Häfele. Call our Sales team on 0800 171 2909 for further information.